Read You Can’t Be Too Safe by Dr. Edgar Romo to learn more about Romo Chiropractic of Modesto and our Chiropractic office in Modesto, CA. Any parent with a newborn to first or second grader knows that car seats are a part of family life. However, many parents may think that if they use the child restraint system that is required by law that their children are safe. But how safe is it? Are they using the proper car seat for their child and is it correctly installed? And what about other factors such as vehicle type, seat location (front or back), etc.? Let’s learn about car seat safety so you can keep your children as safe as possible anytime you hit the open road. The pursuit of the perfect car seat has created a variety of systems, checks and balances in the hope of making our children’s safety a little more secure. LATCH, an acronym for the “Lower Anchors and Tethers for Children” system is one of the latest attempts to decrease the risk of an injury during a crash and help minimize problems related to improperly installed car seats. As of September 2000, all new automobiles (except convertibles) are required to have a special attachment that secures the tether strap found on most new child restraint systems. The purpose of the adjustable straps is to secure the seat to the rear window shelf, floor or back of the vehicle seat. The strap will keep the top of the car seat from moving too far forward, reducing the possibility of head injuries during crashes. In September 2002, a second feature was required: a lower attachment bar with a matching feature on a car seat (buckle, hook or connector) that snaps onto the lower anchor bar of the vehicle. Unfortunately, too many parents don’t know how to install their child’s car seat utilizing the LATCH system, or don’t both to do so. You would think that with all of these new safety measures and car seat laws in every state, children would be completely safe during an auto accident. Not so. Despite all the latest enhancements to car seat safety, injuries caused by motor-vehicle collisions remain the leading cause of death in children ages 3 to 14. They are also the leading cause of disabling injuries in that age group. Just as a seat belt is meant to restrain an adult during an auto accident, the car seat has the same purpose; they are called childrestraint systems, not child life preservers, for that very reason. Many parents mistakenly believe that if their child is in a car seat, they are immune from injury during a motor-vehicle collision; in reality, the purpose of the car seat is only to lessen the degree of risk to the child – it cannot completely remove the risk. It’s easier to comprehend if you compare child car seats/restraints to their adult counterparts: seat belts and air bags. Few adults would consider themselves completely safe just because they’re buckled up and have an air bag-enabled vehicle, so why would children be any safer? Most insurance companies and many parents mistakenly believe that a child in a car seat is somehow invulnerable to injuries. Why is this? Generally, if a child doesn’t complain of pain, it never occurs to a pediatrician or parent that any injury was sustained during the collision. Due to their inability to communicate their pain or discomfort, symptoms such as irritability, lethargy, restlessness, night terrors, poor focus and/or appetite, change in bowel movements and being very clingy may be the only signs that an infant or child has suffered an injury. It’s important to realize that even a child in a safety seat can be injured. They’re may not be thrown around the car or into the back of the seat in front of them, but they can still suffer from the impact. Their body is held to the car by the restraint, but their head and arms can easily be thrown forward, which may cause mild to severe damage to their spine and nervous system. The sports utility vehicle (SUV) is still considered popular these days, partially due to their large size and versatility. Parents also may invest in an SUV because they believe the vehicle’s size protects their children (and them) from injury in a crash. Not necessarily so, according to a recent study published in the research journal Pediatrics. Among all the children in the study, those who were properly restrained were 75 percent less likely to be injured; those who were in the front seat were 106 percent more likely to be seriously injured. In both vehicle types, children exposed to a passenger airbag were 370 percent more likely to be seriously injured. These numbers may not implicate SUVs as more dangerous than regular vehicles, but the real shock came when the rollover crash factor was more thoroughly explored. In any type of auto accident, SUVs are four times more likely to roll over than any other passenger car, and a rollover crash increases the likelihood of serious injury by 229 percent. 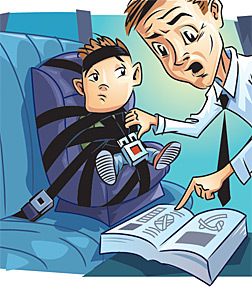 Risk of serious injury in an SUV increases an average of 2,400 percent for the child that is not properly restrained. Despite the fact that the car is bigger, heavier and may feel like a tank in some cases, the increased tendency to roll after impact means that an SUV actually increases the risk of serious childhood injury. Despite all the best intentions, there is no perfect car seat, safety seat or child restraint system because they all require installation. That’s where the human factor (and human error) comes in. The NHTSA reports that more than 80 percent of all car seats are improperly installed; when properly installed, they significantly reduce the risk of childhood mortality compared to a child riding completely unrestrained. If you’re concerned about whether you’ve installed your child’s seat correctly, even after following the manufacturer’s directions, visit the NHTSA Web site, click on the Child Passenger Safety icon and then click on the Fitting/Inspection Station link. You can also call 866-SEAT-CHECK or visit www.seatcheck.org to find a seat-inspection facility near you. No car seat, no matter how well it is installed, will guarantee that your child will not suffer injury in an auto accident. Don’t get me wrong: It may save their life, and is infinitely better than not being in a car seat, but it doesn’t mean they will escape an accident uninjured. If you and your child have recently been involved in a motor-vehicle collision (particularly one that didn’t require a trip to the emergency room), contact your chiropractor to schedule a brief examination. It is better to have your child checked and find out that there is nothing wrong than to assume they are fine and find out later that there was trauma done to their still-developing spine or other areas of the body that could have lasting consequences down the road. Infants (birth to at least 1 year of age or weighing at least 20 pounds) are required to be restrained in a rear-facing convertible seat. Toddlers (over 1 year of age and weighing 20-40 pounds) need a forward-facing convertible seat. Young children (ages 4-8 years, unless at least 4′ 8″ tall and weighing more than 40 pounds) need a seat belt-positioning booster seat in a forward-facing seat position. The child can sit without a booster seat (shoulder/lap belt only) when the lap belt lays across the upper thighs and the shoulder belt fits across the chest (usually at around age 8 or when they are at least 4’9″ tall). Children ages 12 and younger should ride in the backseat at all times. What Seat for What Age? Claudia Anrig, DC, practices in Fresno, Calif., and is on the board of directors of the, an organization that can answer your questions regarding the value of chiropractic care during and after pregnancy.